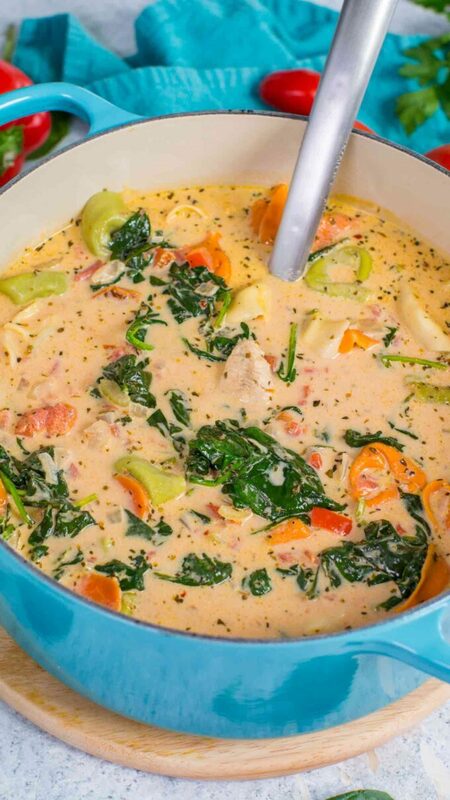 Tuscan Chicken Tortellini Soup is insanely creamy and delicious. Made in one pot in just under one hour with tender chicken, veggies and cheesy tortellini. 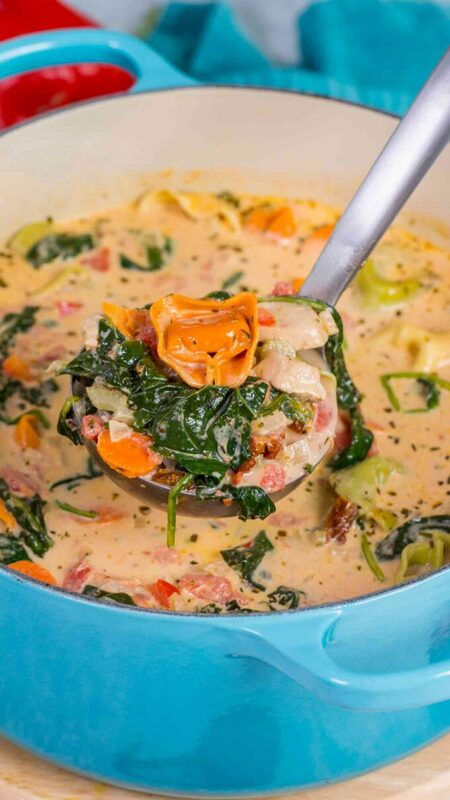 We love making easy soups on our blog, and this creamy tortellini soup, with its all delicious Italian flavors, is food for the soul. We are always excited about soup season and comfort foods. To stay warm and satisfied, you should try our other soup recipes, like this Slow Cooker Baked Potato Soup and the Panera Bread Soups Copycat Recipes. You can tell that I am into soups lately, they just seem the perfect option now. I love making a big pot of soup and not having to worry about dinner for a few days. 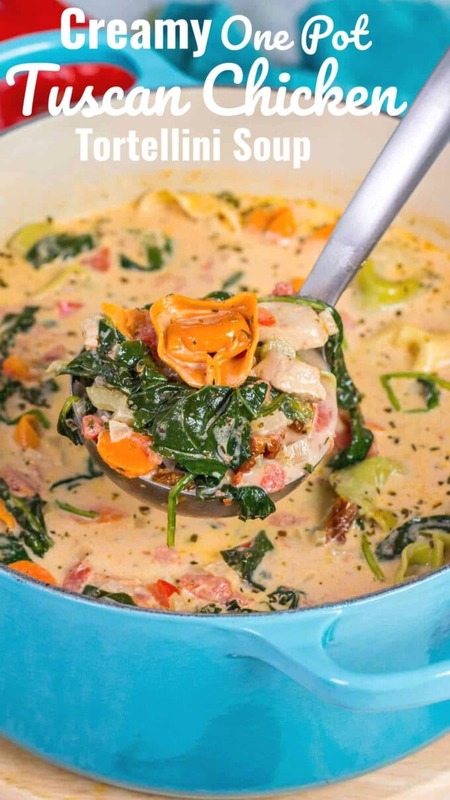 This creamy Tuscan Chicken Tortellini Soup is my latest concoction and it exceeded my expectations. I am a huge fan of Tuscan Chicken, we enjoy a lot this Instant Pot Tuscan Chicken Pasta and also this Slow Cooker version. I wanted to incorporate the flavors of Tuscan chicken into a soup, that is quick and easy to make. 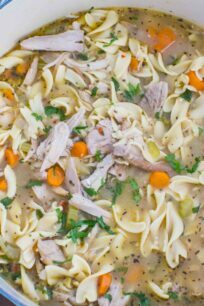 It’s safe to say that I have succeeded and this One Pot Tuscan Chicken Tortellini soup is not only easy to make, but also very flavorful and tasty. The soup is creamy, with a light sweetness from the cream, that balances the tanginess of the tomatoes. 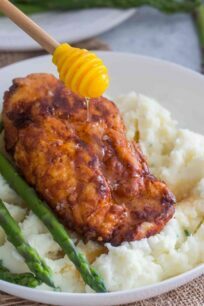 The chicken is tender, browned to perfection and flavored with Italian herbs. This makes all the difference and enhances the broth. Veggies and cheese tortellini are added to the soup, finished with some fresh spinach. First, brown the chicken, add the herbs to the chicken and cook, stirring for a few minutes. This step is very important, as cooking the veggies with the chicken will add extra flavor to the meat and to the broth. Add the veggies, cream and broth to the saucepan, cover and simmer for 10 minutes on medium heat. Next, add the tortellini and simmer for about 10 more minutes until the tortellini are cooked through. At this point, if you would prefer a thicker soup, add the cornstarch and water mixture and stir to combine. Simmer for a few minutes. Fold in spinach, stir until wilted. Serve soup garnished with chopped fresh parsley and warm bread. Brown the chicken or use rotisserie chicken. Add all the ingredients to the slow cooker, with the exception of cream, tortellini and spinach. Cover and cook on low for 7 hours or on high for 4 hours. Uncover and add the cream and tortellini, stir well to combine. Cover and cook on high 45 minutes until the tortellini are soft and cooked through. Uncover and fold in the spinach, completely submerge the leaves. Cover again and cook on high for 10 minutes, until spinach leaves have wilted. Select Saute and brown the chicken in the pot. Add the rest of the ingredients with the exception of: cream and spinach. Stir well to combine. Select High Pressure -> adjust timing to 5 mins -> followed by 10 mins NPR. Release manually any remaining pressure. Open the Instant Pot, select Sauté and stir in cream. At this point add the cornstarch mixture if you would prefer a thicker soup. Simmer uncovered for 5 minutes. Turn off Instant Pot and fold in fresh spinach. Absolutely. 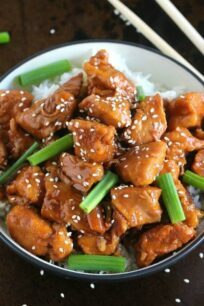 You can use chicken thighs meat or Italian sausage. Ground chicken, turkey or beef can also be used, the soup will be thicker in that case. Actually, any tortellini will work, I prefer to choose cheese or three cheese tortellini. Also, keep in mind, if you decide to use mini tortellini, those will cook quicker, so keep an eye to not overcook them. Frozen tortellini can be used as well, make sure they don’t have any ice on them. Stir well and cook for a few more minutes, until done. Just skip the chicken and keep the rest of the ingredients. Replace the chicken with canned (drained and rinsed) white beans. You can use about 2 15oz cans. Cooked lentils and canned (drained and rinsed) chickpeas also work great int this recipe. Use a cup to transfer the soup from the pot into freezer safe quart bags. Lay the bags flat in the freezer. The bags can nicely be stored in the freezer for up to 2-3 months. Thaw the soup overnight in the fridge or add the frozen bag to a large casserole dish and place under running warm water. Transfer the soup to a dutch oven or saucepan over low-medium heat. When reheating, you may need to add a bit of milk or cream, add ¼ cup at a time. Stir to combine and simmer for 2-3 minutes. Place a large saucepan or dutch oven on the stove over medium heat. Once hot, add the butter and melt. Add chicken cubes and cook until golden brown. Add dried herbs and seasoning: Italian seasoning, oregano, thyme, pepper flakes, salt and pepper. Stir to combine and cook for 2 minutes, stirring. Add diced onion and garlic, cook for about 3 minutes, stirring occasionally, until the onion is tender and translucent. Add the rest of the veggies: bell pepper, celery, carrots, canned tomatoes and sun dried tomatoes. Add the chicken broth and cream, stir to combine. On medium heat, bring to a boil, reduce heat to low, cover and simmer for 10 minutes, stirring occasionally. Add the cheese tortellini, stir and cook until tender on low-medium heat. Stir occasionally. Taste and adjust for salt and pepper. If the soup is too thin for your liking and you would prefer a thicker broth, mix in a small bowl or cup the cornstarch with the water until fully combined and add the mixture to the soup with the tortellini. If the soup is still too thin, add another round of cornstarch slurry and simmer for 5 more minutes on low heat. Careful as the soup will thicken more once it starts to cool. Once the tortellini are cooked, reduce heat to low and fold in fresh spinach. Fully submerge it under the liquid and gently stir. Cook just for a few minutes, until spinach is wilted. Remove soup from heat and serve garnished with chopped fresh parsley. This is my kind of soup. It looks incredible. 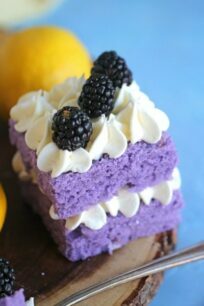 I’ll have to make this soon. It’s starting to get chilly, and I love soups when it’s cold out. Soup on really going to be on the menu this cold windy week. 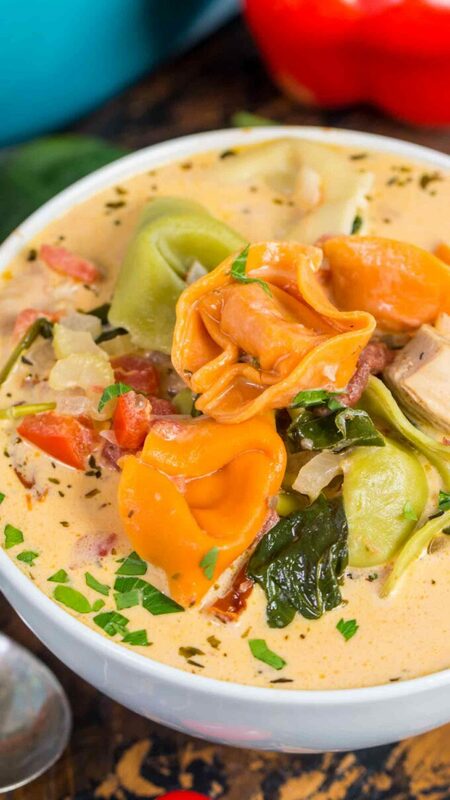 We love tortellini soup and yours looks so warm, hearty and delicious. This looks like it would be a great dinner on a cool fall night. 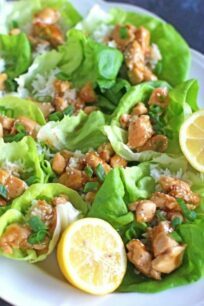 I’m pescatarian so I don’t eat chicken but I’m sure those who do would love this recipe. Oh my goodness that looks so good! The temperature is just starting to drop here so this is the perfect way to warm up a chilly evening. Oh my, this looks so good!! I love all those flavors and I have never made soup with tortellini but I think I will try this one for sure. Pinning for later and sharing on Facebook. With Fall here and the Weather cooling down I love finding new Soups we can make for dinner. I can’t wait to show this to my family and see if they would be willing to try the Soup out. That is a soup that has ebery food group and is a great one pot meal that I love. I will try and learn some of those great secrets to making a perfect creamy soup. Wholy cow does that look good! I love this time a year because soup is perfect for this fall weather. This is totally going to happen. It is making my mouth water just looking at it. It’s soup season! Finally, I feel like i have been waiting forever. This looks and sounds delicious. I’ll be giving it a try soon. Very soon. Yum! 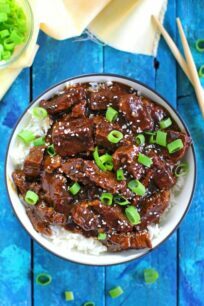 This recipe could not have come at a better time. I love making soups during the fall months. 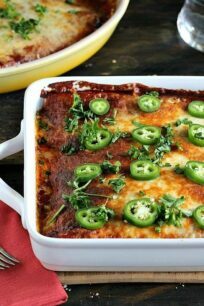 This recipe looks savory and would be perfect to make next week for dinner. Ok, this soup looks amazing and is perfect for the cooler temperatures outside! 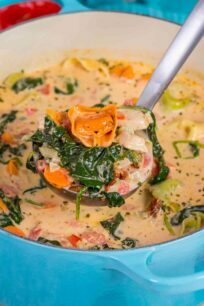 I want to give this a try, I always make the same soups and this is a new one for my family to try. I’m all about one pot meals! It’s so much more convenient and saves so much time. I feel like if you put the word “tuscan” in any recipe I am in. This looks completely amazing. I’m collecting soup recipes to make over the winter. This one made the cut. It looks easy but extremely tasty! This looks like something my husband would love! 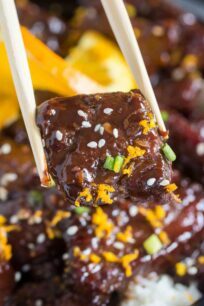 I will definitely have to try this recipe soon. I’m a huge fan of tortellini. I’ve already had my meal for the day but this Tuscan Chicken Tortellini Soup looks so good, I’m hungry! Wow this dish makes me hungry! 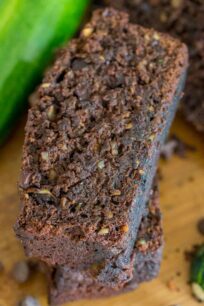 It looks delicious and I am grateful that you shared the recipe. I love that you made this soup in one pot. DUring fall and winter, I eat a lot of soup. I gotta try this recipe. I am SO obsessed with tortellini and always crave recipes that use this pasta as a main ingredient. Looks like i”ll be making this soup soon! Perfect for fall!